in our last post I told you that the design aspects for our new pattern for Spring 2019 were pretty much solidified unless we had a “EUREKA” moment or an overwhelming compulsion to change up a particular feature… well, guess what? DO read all the way thru this post to see how one simple O-ring can add a whole ‘nother dimension to this bag! But first… Let me introduce you to this sample! Here’s a peek inside the front compartment. I’ve gotten so I really like to have multiple slots for various pens as well as maybe a small flashlight in my bag. The back compartment is larger than the front and includes a generously sized mesh pocket to keep small loose items in place and easy to find. There’s a deep slash pocket on the bag back and I like storing my phone here. I know some of you may be worried that this pocket isn’t mag-snapped closed, but since I’ve been carrying this a sample of this bag for over 2 months with absolutely no problem with items falling out, I went without a closure this time. And since several of you have been asking for a picture of this bag with a human carrying it, and since on most days I qualify as such, here ya go! I’ve found that I’ve really enjoyed carrying this bag. My wallet easily fits inside (placed on end of course) as well as an IMPRESSIVE amount of additional items. It came to me in the shower last week that if I added a simple O-ring to the grab n’ go handle of this bag that it could be probably be converted to a backpack! I tried this by running the strap thru the O-ring and clipping it to the D-ring on the opposite side of the bag, but found it was very difficult to put on in this arrangement. Not impossible, but difficult. Additionally, I’m not sure the shoulder strap is long enough so it can be comfortably worn by all body types in this configuration. 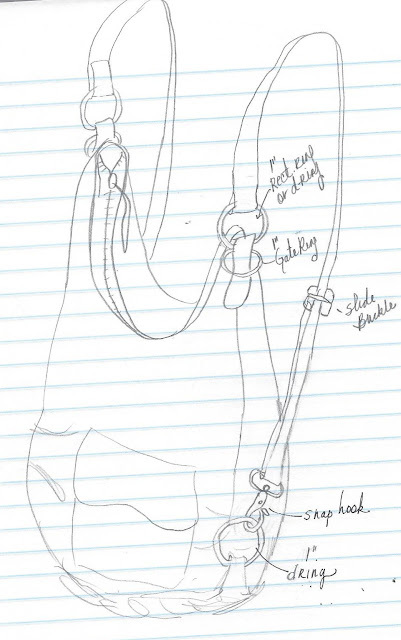 The shoulder strap could possibly be made about a foot longer, OR…. And now, a few words about this unbelievably beautiful fabric! This border print was designed by Jason Yenter for In the Beginning Fabrics and its called DreamScapes II. And FYI, I spent a LOT of time fussy-cutting the darker areas of this print for use along the side areas of this sample, but here’s the thing… It really did waste a lot of fabric PLUS, in the end I think it would’ve been just as effective (and a WHOLE lot easier) if I had just used a flat black for the bag sides. SO, if you love this fabric, here’s some GREAT news! We’re carrying it on our website NOW! Just click HERE to find out more information and to pick up some yardage for YOUR next project or to duplicate this look when the pattern is released!! And now…. it’s YOUR turn! I’d of course love to know what you think of this, our latest sample of our new design, but perhaps more importantly I’d value your comments about the backpack option! Yay or Nay? Should we pursue this it, or just drop it! And remember, we love reading your comments and answering your questions too, so please feel free to leave either or both in the space provided below. Join us in our FaceBook Group! It’s just for StudioKat Designs customers and its the perfect place for you to post pictures, comments or questions about our patterns! How cool is that, right? And don’t forget to check out the best sewing pins with me on Pinterest, get your daily sewing fix and behind the scenes scoops on Instagram, and be the 1st to know about new patterns, discount codes and sample sales by signing up for “Kat Bytes”, our monthly newsletter. PPC8- Is Bigger REALLY Better? 18 Comments So Far, You're Next! I like the idea of the backpack conversion. It makes shopping more hands-free. I have problems with single shoulder straps slipping down. Me too on the backpack. Lots of reasons to want my hands free a lot of the time! I notice a good number of ladies using a backpack purse, young women with kids, and older ladies with walking aides, or just a desire for better balance. Easy on easy off=bonus points. Thanks Susan. I’m so glad we could work this out! Thumbs up on the backpack option. Could this also work on the sling along? I love the idea of switching to a backpack. Going to work with my work bag. My lunch bag, a purse, a jacket and a cuppa. really do I need all? YES. So this makes perfect sense. Get that pattern ready alreadyI want it. How do I order the fabrics used in the new Bangle Buddy pattern? Did you scroll all the way thru the post? Because we have provided a hotlink to the fabric near the bottom of that post for your convenience. I love your backpack option because the extra straps are not there all the time but handy if you need it. Great idea. As far as the fabric goes…it’s amazing!! Love the backpack option…I will only buy this type which also includes a cross body option. As I age..my shoulders are more slanted., so a shoulder bag slides off ! The BP also gives a better balance with making me stand up straighter ( when full of course) ! Can’t wait ! Like this, do you make kits? Did you read through to the bottom of the post? This fabric is already available on our website and there’s a link provided for your convenience. We do offer kits but they never include fabric. We prefer to sell the fabric and the notions/zipper kits separately because the fabric sometimes becomes unavailable (at the manufacturer) quite quickly. Hi. I too would like to know if there will be kits available for your new bag, including this beautiful fabric. No doubt you’ll mention it when you put the pattern on the market. 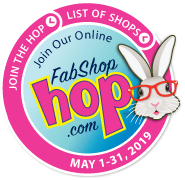 Hint for FabShopHoppers: Looking for the Bunny? You'll find him in our "Eye Candy" patch! 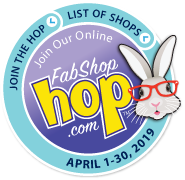 Find the Bunny that says "You Found It!" All logos, graphics, text, designs & images are copyright protected and the property of StudioKat Designs. © 2004–2019 StudioKat Designs. All Rights Reserved.